How important is workplace safety in tackling wider societal issues? Does our lifestyle influence morbidity and early mortality for our communities? How can we use exposure data to evaluate toxicological risks to the health of our population? On this one-year course, you’ll explore the scientific, health and psychosocial factors influencing health and safety in the 21st century. You’ll study current and emerging legal and compliance issues, and consider the many factors that influence workplace safety and health, such as legionella, contaminated land and air quality. You’ll learn how to formulate, implement and evaluate safety, health and environmental (SHE) management systems for an organisation, including concepts and techniques of occupational health and safety management. Topics you’ll investigate include the principles and practices of risk management in the workplace, environmental protection and management, and the principal diseases of significance to public health. You’ll develop your knowledge of HAZOP (hazard and operability analysis), Major Incident Contingency Plans (MICP), and occupational hygiene management. You’ll consider topics such as benchmarking safety and risk management and assessment of hazards, risks and dangers at work, including processes in the development and management of ISO 14001 (environmental management) and ISO 45001 (occupational health and safety management) standards. As well as studying theory, you’ll have practical sessions. You’ll learn skills in how to identify, evidence and analyse concerns for safety at work, such as assessment and control of occupational risks that arise from exposure to hazards at work including noise levels and extreme working environments. Industrial site visits - You’ll go on visits to specific areas of SHE and health and wellbeing settings. Practical sessions - You’ll have sessions to help you develop the skills to identify, evidence and analyse concerns for human health. Professional development - Upon graduation, you will be entitled to register for Student and Graduate Member status of the Institution of Occupational Safety and Health (IOSH). 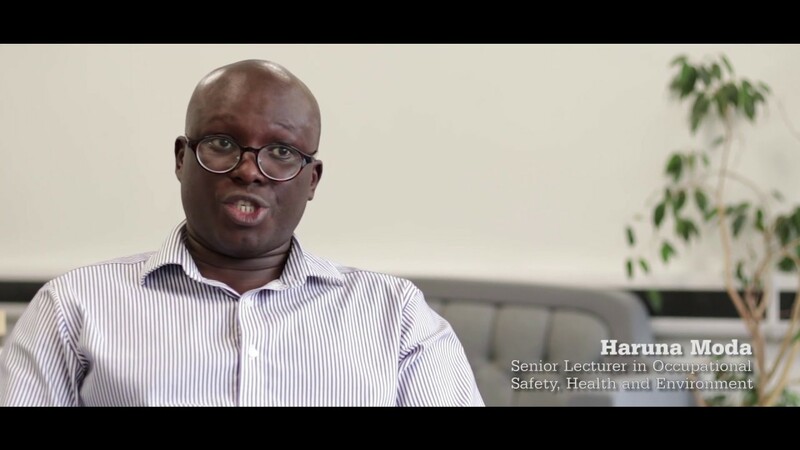 As a graduate, you’ll use your practical skills and academic knowledge to help ensure compliance with safety legislation and safety policies in a wide range of organisations, from large scale industries to small businesses. You could develop your career in industries such as oil and gas, construction, manufacturing, or in relevant government departments. Roles include occupational health and safety managers across all industry sectors, health and safety advisors, HSE auditors, and consultants. You will normally have a good honours degree (minimum 2:2), or international equivalent, in a relevant subject or significant proven experience in a relevant field. Overseas applicants will require IELTS with an overall score of 6.5 with no less than 5.5 in any category, or an equivalent accepted English qualification. Accepted English qualifications can be viewed here. We offer an Excellence Scholarship of £2000 to UK students on this course who have achieved a 2:1 degree classification or higher. Workplace safety and worker health is increasingly significant in tackling wider societal issues around morbidity, early mortality and the influences of lifestyle on individuals and communities. Through this course, we aim to develop your analytical and problem solving skills, and to introduce you to the multitude of factors that can influence workplace safety and health. This is to help you become a practitioner in preventing accidents and ill health in the workplace, and in managing workplace environmental issues. You’ll explore topics including risk perception and risk management, law, occupational hygiene, and environmental management. You’ll learn how to critically assess the evidence on the health and wellbeing of a defined population, and how to analyse exposure data to evaluate toxicological risks to population health. You’ll consider occupational health and safety philosophies for effective control and health protection purposes, and evaluate risk management systems for specific workplace environments, including the gas, oil and food industries. You’ll go on site visits to a variety of industrial and commercial settings, such as manufacturing industries, construction sites and waste treatment plants. You’ll apply the knowledge you learn on visits to risk assessment, management and compliance requirements, maintaining workplace safety, and to building infrastructure and compliance systems. For your dissertation, you’ll submit your research proposal (usually 1,000 words) and write a piece of work presenting your research findings (approximately 16,000 words). Past dissertation themes include stress management and safety impact in high risk industry, silica exposure among construction workers and impact of extreme climate and outdoor workers. Upon successful completion of this course you’ll receive a Masters in Occupational Safety, Health and Environment and eligibility to register for Graduate Member status of the Institution of Occupational Safety and Health (IOSH). Students will evaluate epidemiological evidence to inform public health decision making across a range of issues to critically assess the evidence on the health and wellbeing of a defined population. This is especially relevant to particular working practices and patterns, and community influences on worker health. This unit explores the applied sciences of epidemiology, toxicology and microbiology and develops skills in identifying and evidencing a range of human health concerns from exposure to physical, chemical and biological agents. The unit guides students on how to research issues of professional interest and relevance through the use of appropriate research strategies and to deepen their knowledge and understanding around emerging issues. Students will explore effective partnership working in the local, national and global environment, including the influences and appropriateness of interventions with respect to social and organisational culture, and the health impacts of places of work to bring about a reduction in the incidence of injury and disease through targeted risk management strategies. This unit allows students to develop advanced understanding of the interdisciplinary links between environmental research, management strategies and policy frameworks fundamental to environmental management. Teaching reflects the variety in the dynamic environment of various work settings, including atmospheric pollution, climate change, and sustainability. Field visits are included to provide balance between application of theories and practical interpretation of environmental impacts. This unit provides students with a deep understanding of the legal requirements, liabilities and offences relating to occupational health and safety responsibilities, incorporating the statutory liabilities and guidance on the assessment and management of risks to human health in the workplace. This unit examines the use of standards in the control of SHE issues at work and analyses available control strategies to manage, ameliorate or remove risks to the environment. Our Department of Health Professions teaches subjects including physiotherapy, speech and language therapy, and nutritional sciences. The department is committed to ensuring its courses stay relevant and up-to-date with current professional practice, by maintaining links with colleagues in clinical practice and research. UK and EU students: Full-time fee: £8,500 per year. Tuition fees will remain the same for each year of your course providing you complete it in the normal timeframe (no repeat years or breaks in study). UK and EU students: Part-time fee: £945 per 20 credits studied per year. Tuition fees will remain the same for each year of your course providing you complete it in the normal timeframe (no repeat years or breaks in study). Non-EU international and Channel Island students: Full-time fee: £15,500 per year. Tuition fees will remain the same for each year of your course providing you complete it in the normal timeframe (no repeat years or breaks in study). Non-EU international and Channel Island students: Part-time fee: £1723 per 20 credits studied per year. Tuition fees will remain the same for each year of your course providing you complete it in the normal timeframe (no repeat years or breaks in study). A Masters qualification typically comprises 180 credits, a PGDip 120 credits, a PGCert 60 credits, and an MFA 300 credits. Tuition fees will remain the same for each year of study provided the course is completed in the normal timeframe (no repeat years or breaks in study). Laboratory coats, laboratory equipment and consumables are all provided at no additional cost to the student. Consumables associated with Dissertation study are allocated a budget and are at no cost to the student. All of the books required for the course are available from the library. The University also has PC labs and a laptop loan service. However, many students choose to buy some of the core textbooks for the course and/or a laptop. Students may also need to print some of their assignments and other documents. Campus printing costs start from 5p per page. Estimated costs are £300 for a laptop up to £100 each year for books and printing. Optional study events associated with professional bodies may incur a charge. The quickest and most efficient way to apply for this course is to apply online. This way, you can also track your application at each stage of the process. If you are unable to apply online, you can apply for postgraduate taught courses by completing the postgraduate application form. There are exceptions for some professional courses – the course information on our on-line prospectus will give you more information in these cases. Please note: to apply for this course, you only need to provide one reference.